The first thing I starting making when I finished higher education was card holders, the idea came to me when I started to think about useful things that people might need. The bonus of living in London also meant that the birth of the oyster card almost guaranteed that the market for card holders was big and still growing. I initially thought I would make them out of fabrics that I had designed and printed myself but when stumbling upon my mighty collection of 80s comics from great classics as Mickey Mouse to My Little Pony, I instantly knew I wanted to use these as it meant I could recycle these old childhood memories and put them to good use again. Equipped with a few good comics I made my very first stack of bus/oyster card holders and gave them to some of my close friends to road test. Once satisfied with their durability one of those friends who happened to own a shop in Shoreditch East London (the shop was called Brag which sadly no longer exists but she is still printing lots of great things, check her site out at bragclothing) was thrilled with hers so began to stock them in her shop and continued to for the next few years! I also gained another stockist for the comic card holders from here for a shop called Boutique Babylon which is situated in South London on Clapham High Street and they still stock them there today. 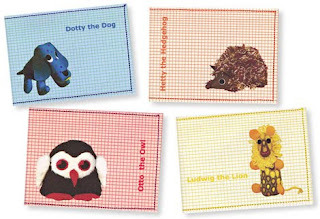 At that time the craft craze was growing and when asked to make some cardholders specially for the LadyLuck website I wanted to reflect this....and whilst browsing through many vintage annuals and crafty books I came across some cute vintage toy making instructions and became inspired to transform them into a posse of retro looking card holders. By using the vintage toy pattern instructions this product has two uses as full instructions on how to make yourself your own stuffed animal friend are included within the design..
And in the November of 2007 they were available to buy online!! 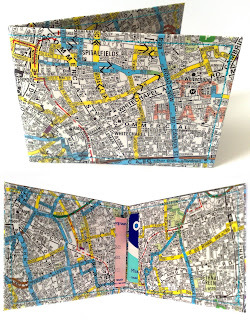 London Maps; an idea suggested to me by a close friend - Fifi who owns Covet a lovely shop in Islington now also a stockist of them too.. Which have turned out to be a big hit as people love to find the ones with the area or street that they live in! When I first began making these holders about two years ago for my close friends and family I never imagined that I would still be making them today! But they continue to be one of our best sellers online and at craft events too! Someone was even kind enough to write a lovely little blog about them too which you can read on Crafty Crafty. Check them out now on our online store and see which design is your favourite.....?